Coach Nathan Buckley heaped praise on full back Henry Schade after locking down Sydney superstar Lance Franklin. Collingwood has named two players for their club debuts in Friday night’s season opener against the Western Bulldogs. Henry Schade's surname lends itself to plenty of interesting nicknames. We asked our Twitter fans what they've chosen as our new key defender's moniker. A key defender who played 20 games in five years on Gold Coast's list. Schade was originally added to the Suns' list with the 24th selection in the 2011 National Draft. It took him longer than any other Gold Coast player to earn a debut, but he didn't miss a beat upon his selection early in 2015 and played 15 of the final 18 games. Schade was given key roles on the opposition's best forwards, combining with the likes of Steven May and Rory Thompson. He managed five senior games early in 2016 but none after round 10, and found himself off the list at season's end. 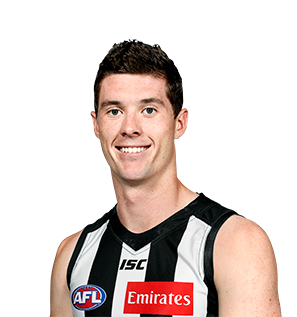 Originally from North Hobart, Schade joins fellow Tasmanian Jeremy Howe on Collingwood's 2017 list. After playing 15 of the last 18 games of 2015, Schade managed just five games in 2016, and none after round 10. He played 11 games in the NEAFL, averaging 14.1 disposals and 5.0 marks per game, as well as 4.2 rebounds. Delisted at season's end, Schade was Collingwood's second selection in the December Rookie Draft. After not making a senior appearance in his first three years at the club, the lanky Tasmanian made huge strides in 2015, playing 15 games at the top level. Largely played as a third tall defender but occasionally as the second main man when either Steven May or Rory Thompson was missing. At 197cm, he gets his long arms in to spoil when he seems out of the contest. Has good defensive discipline and, despite starting off a bit shaky with ball in hand, developed that part of his game as the season wore on. A project ket defender who has spent three years in the system, Schade showed signs of improvement in 2014. The lanky Tasmanian was pushed forward midway through the NEAFL season to further educate him on the nuances of defence. He responded positively with improved form late in the year once he returned to the more familiar surroundings of the back 50. With two years of development behind him, Schade is edging closer to his senior call-up. He came ot the club as a lanky defender without much muscle, but has slowly added size to his 196cm frame. Schade has done well at NEAFL level with his good closing speed and strong left foot kick, but the Suns have been in no rush to expose him at the top level. The Tasmanian has signed on until the end of 2015 and, with key position defenders Matthew Warnock, Nathan Bock and Tom Murphy all ageing, should get plenty of opportunities in the coming years. The lanky Tasmanian spent his first season in the system in the Suns' NEAFL team. Was Gold Coast's only selection from the 2011 National Draft and used the past 12 months to put bulk on his skinny frame. Plays key defence and has a good left foot kick. The Tasmanian full back is an impressive size at 196cm and his courageous play with the North Hobart Demons in the Tasmanian State League has won him plenty of admirers. Is willing to attack the ball and uses it well when coming out of defence.